Bead board VS cardboard strips for scenery support. 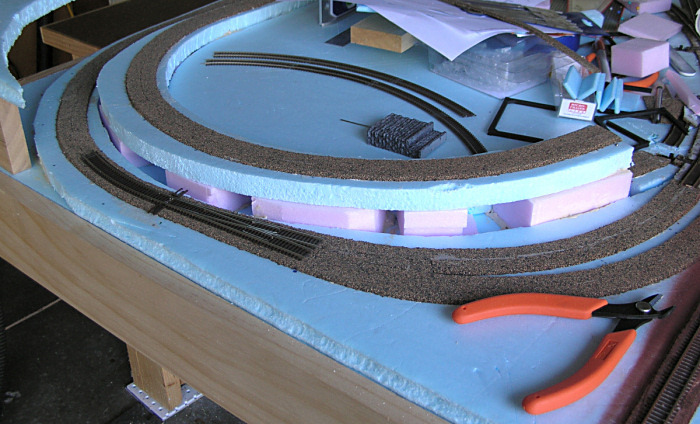 Styrofoam, Bead Board, expanded polystyrene, is taking over the hobby as a means to support; or, produce scenic shapes of the land forms our miniature trains cross. Back when I started my current layout, Screen wire and cardboard strips where what the average modeler built his scenery base with. I chose to use cardboard strips as they where free and all I had to do was cut up cardboard boxes and make 1 inch wide strips of them. I interwove the strips, giving me a lattes work and I used hot glue; or, carpenter's glue to glue the cross strips together, holding the joints together with clothes pins while the glue dried. Where I could, I stapled the ends of the cardboard strips to my plywood sub road bed; or, plywood support structure. Over this lattes work, at first I placed paper towels dipped in plaster. Later and still now, I use plaster impregnated gauze from Woodland Scenic's; or, other. This has worked very well and I love how this was capable of producing very strong, very mountainous terrain. Obviously I am missing the reason so many now use Foam Board. At Menards on-line today, they are quoting a price of $19.99 for pink 1 inch thick, 4' X 8' sheet. My guess is that hundreds of dollars can easily be consumed by using this process to build an average sized layout. Also, to me, it would seem that carving this material into scenic shapes would produce copious amounts of scrap, litter and dust. The people who espouse this method of building scenery, state that it is so easy to poke trees into the foam! I have to guess that this can not be the only reason foam is used, as drilling a hole in my plaster and cardboard scenery and sticking trees into them works well, also. Certainly, if money and the amount of clean-up work aren't an issue, then I can see foam board as a scenery base might be acceptable. So, what am I missing that explains why foam has gotten so popular? 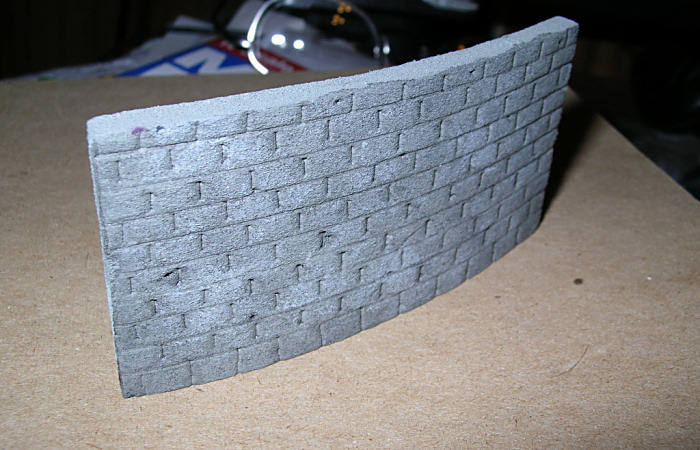 For most of my terrain, I used a basic wooden skeleton covered in regular window screening (metal screens works better than plastic ones) which was then covered in layers of plaster. Thin at first and then thicker layers in the end. Super strong and no problem inserting trees. Although, the thought of just poking a tree in without having to drill a hole is appealing, but I haven't had a problem drilling a hole, either. I guess I avoided cardboard initially as I was a bit concerned about it's strength. Then again, I also have a few sections that are cardboard based, and they seem to be holding up just fine. I used most of the scenery base methods from using foam, rosin paper, window screening to cardboard strips. My preferred scenery construction method is cardboard strips covered with plaster cloth. The combination provides a solid base for scenery and a sturdy base to mount trees. The dried plaster cloth accepts paint well and is not damaged to easily. I use different methods depending of the location on the layout. The time spend on the plaster method will take more time. I prefer the plaster method for smaller areas and styrofoam for larger areas. I pretty much agree. I use cardboard and plaster for my very few elevation changes. That's only for surrounding scenery, there are no grades on my track. I would guess that the biggest reason would be the weight savings. If you had to move a layout due to a move, or if you had modules you were taking to a show, I would imagine a foam mountain of size would weigh little to nothing. 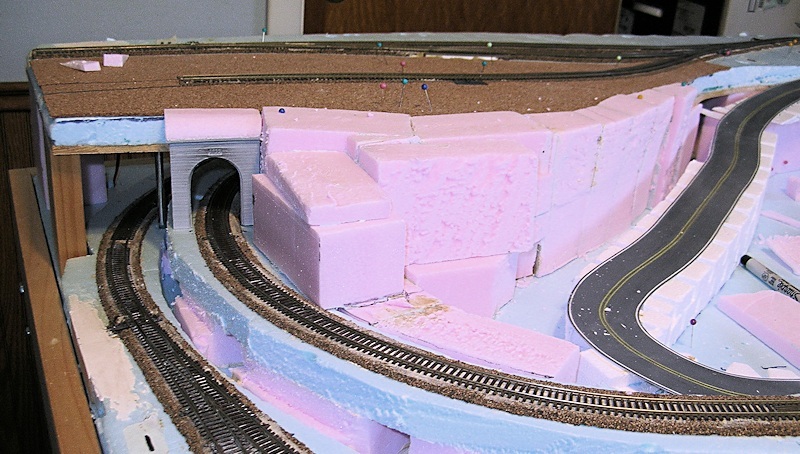 I tries the foam mountain method on my N scale layout, and just didn't have the knack for carving it. I experimented with a lot of methods, and found the cardboard strips, and plaster cloth to be my desired method. I can see the appeal of foam due to the fantastic work that is being done with it, but like I said, I never had the knack of carving it. It shaped with a hot wire cutter really nice with little to no mess, but I couldn't carve rock faces in it worth a darn! It's my understanding that cutting some foams with a hot wire tool can emit noxious fumes! Best to determine if the foam your going to use is one of those foams. 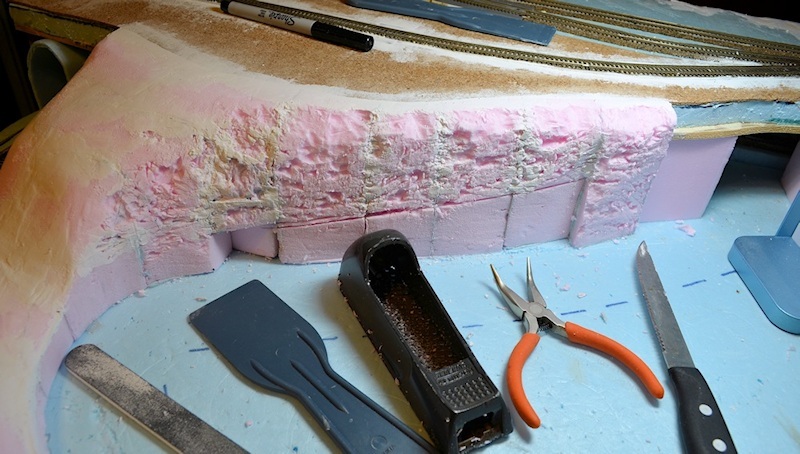 For my small N-scale layout, I used extruded polystyrene (blue and pink) for almost everything. One of my main goals was a lightweight layout. The sub-roadbed and risers are foam. I cut the sub-roadbed cookie-cutter style from a single sheet of blue foam using a serrated steak knife. I cut the pink foam risers on a miter saw. I made rocky landforms with a variety of simple tools and a little spackle to fill any gaps. I'm happy with the results. I mainly use foam covered with plaster cloth now, easy to work with and light weight. Never tried using the hot wire method, just scribe and snap then shape with a surform. I've never paid for styrofoam as scraps and big pieces are free at construction sites. Jeff that's some great scenery there, very nice! I can understand the use of foam for a layout that needs to be mobile, built in an apartment, rental home, taken to shows, etc. etc... There are many reasons to build with lightness in mind. Essentially all of the model railroads built by the Model Railroader Magzine's staff, excepting the Milwaukee Racine and Troy. which is Model Railroader Magazines Club layout are portable layouts, for good reason, they are wheeled out and some project done on them and then wheeled back to some storage place while not in use. When I started this thread, my intentions where not to cause derision in the ranks; but, to explore why people used foam as a scenery base. I am also interested in other methods of building scenery than plaster soaked towels/plaster impregnated gauze over cardboard strips, screen wire, foam; or, other base. I know now that I have been mistaken about how foam was used. I assumed it would only be the base, over which plaster towels; or, plaster impregnated gauze; or, simply plaster would be troweled on. In many cases this is exactly how it is used. However, in actuality, people do use the foam alone without any shell covering it. My aversion to using foam stems from my maybe misunderstanding of the amount of mess that carving the foam makes. You start with blocks of foam and carve away much of it with serrated kitchen knives. Then, if needed, sanding blocks, rasps and other types of abrasive tools are used to get the shapes desired. All of this paragraph would produce a bunch of scrap to cleanup! Am I right; or, wrong? Can I ask Jeff (jdetray), how you made the foam look like rock? If you go with the white bead board you'll definitely have Christmas in July, it really makes a mess! The blue or pink board still produces a lot of mess but seems easier to contain, at least in my experience. I keep a shopvac going for heavy shaping. I've heard that keeping bounce sheets on your person or grounding yourself makes less mess. I'm pleased that you think it looks like rock! That was my intention, of course, but one never knows if someone else will see it as I do. First I stacked blocks of foam to create the rough shape of the area. I glued the blocks together with either latex caulk or Loctite PL300 foamboard adhesive. Then I started hacking away with the tools pictured in my earlier post. I gave the area its overall shape using the serrated steak knife, Surform tool, and sanding stick, followed by filling the gaps between the foam blocks with spackle. Then I began gouging out more or less random chunks of foam using the needle-nosed pliers, serrated knife, and the corner of a putty knife. I occasionally referred to photos but soon realized that nature is pretty random, so I could be random, too. The real key was the painting, and reference to photos really helped. Rocks are NOT a uniform color! After painting the rocks an overall light gray acrylic, I applied a thin black wash -- a small amount of India ink in some isopropyl alcohol. This settled in the cracks and crevices, emphasizing the shadows. It also darkened the overall gray color somewhat. Then came some dry brushing, with both tan and light gray, to provide some random color variation. Finally -- and this is super important -- I dry brushed white paint on all upward facing rock edges. This gives an illusion of natural light falling on the rock face, creating highlights. Don't slop on the white paint -- learn the dry brush technique. I'm certainly no expert at this. Master modelers will probably laugh at my techniques and explanations. Regarding the mess, working with extruded polystyrene (XPS) generates foam dust, just as working with wood generates sawdust. I also do woodworking, and I don't think that XPS foam is any worse than wood. Both are easily cut with a table saw and miter saw (and in the case of XPS, a steak knife). Both clean up easily with a shop vac. This does NOT apply to the white beaded foam often used as packaging material. That stuff makes a horrific mess. It's much more "staticky" than XPS -- a nightmare to clean up. I use two-inch polyiso foam which is much less messy than pink or blue stuff. It cuts real easily with a steak knife, and also sands real easily with just a 3M sanding sponge. It creates little debris, is very lightweight, and is far less messy than mixing up some plaster. I also bought some of Woodland Scenics' Shaper Sheet which I'm excited to try. I've tried all the standard scenery-making materials (including aluminum screen and Great Stuff! ), as well as a few unconventional materials (e.g., heat-forming sheets of Sintra® PVC), but anytime I can avoid mixing up some plaster, I do. It certainly does look like a granite rock face! I think you've captured the look very well. Above is a rock face that I made. I call this area Hoo Doo Gulch. It was made with Cardboard strips overlaid with Plaster impregnated gauze from Woodland Scenics. Over this and working in small areas, I troweled on a layer of Sculptamold. I needed to work in small areas because the Sculptamold sets-up in about 30 minutes and you want to work it when it is almost ready to set-up. The area shown was likely done in around 6 sections, especially because of the columns or Hoodoos shown. I made vertical crevices, sectioning off rock faces, followed by horizontal striations. Overall it is an attempt to make the rocks look sedimentary. People call this carving the rock; however, it's not really carving as much as molding the features on the face while the material is wet and workable. I color my rock with Acrylic Paints, the overall color is Raw Sienna, Burnt Sienna, with some Ochre and other earth colors. I mix my colors with water giving a fairly thinned consistency, then use a pump spray bottle to squirt these mixtures onto the rock faces. After I have the rocks coated in color and like what I see, I will go back with a 1 inch sized brush dipped in very thinned black and paint the rocks with this mixture. The black will settle in the cracks and fissures and give shadows. I also use white dry brushed on the faces to highlight the tips of the rocks and brush in a downward stroke. In the top middle of the above photo is a rock casting, made with Hydrocal plaster in a Woodland Scenics mold. I glue these dried castings to the face of the impregnated Woodland Scenics cloth with Sculptamold. I do not find working in plaster; or, Scultamold to be messy propositions. I am no longer dipping paper towels in plaster, which was dirty and messy. A layer of newspaper on the floor captures any liquid dripping from where I am working and clean-up is simply a matter of rinsing my mixing bucket and tools in water and pouring the the cleaning water outside. To each his own it seems, or whatever method seems comfortable to you. I have never tried anything other than the hardshell plaster made with strips of cloth over crumpled up newspaper and laced with plaster castings of which I made the latex molds using real lumps of coal - which make the best looking formations. It's been a long time, but I do not remember it being that much of a mess. I placed newspaper on the floor per Mark's doing. All of the photos which have been provided are some good study. I would have trouble picking a winner! I only have one question: Celluclay or Sculptamold! I've only used Celluclay, and really like how easy it is to work with. It can also be reshaped by re-wetting it. Opinions? Nice looking burgers, there! If this product works like Sculptamold it is a wonder product to work with. Above is a rock face that I made. I call this area Hoo Doo Gulch. Your Hoo Doo Gulch rock face looks terrific. Your description of the painting/weathering process sounds much like mine. A granite look was my goal, since my layout is set in New Hampshire. I've avoided "wet" scenery techniques as much as possible. My layout is in my home office, an undesirable place for dripping liquids. 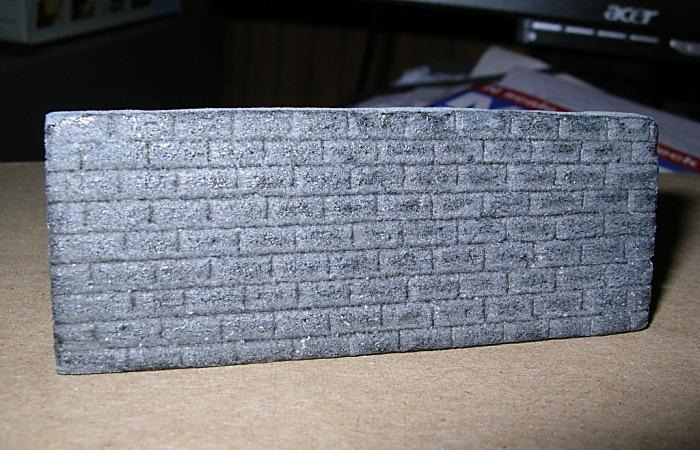 Another foam technique I've experimented with is embossing 1/4-inch sheets of XPS foam to make retaining walls. I use a metal straight edge and a flat blade screwdriver to emboss the foam. And here's a curved one. Those are AWESOME looking walls!